My Mother: I need you to put these wontons in the oven for TEN MINUTES. TEN MINUTES. TEN MINUTES. TEN MINUTES. DO NOT BURN THEM. I'm going on a walk. TEN MINUTES. My Sister: You know you burnt the wontons, right? My Mother: WHAT DID I TELL YOU? Yes. This books is so good that it is worth burnt wontons. (My brain: that doesn't sound like the highest compliment. Me: Did I ask you?) That phrase might not sound like a wonderful assessment of the book, but if you ask me, burnt wontons are a high price to pay. 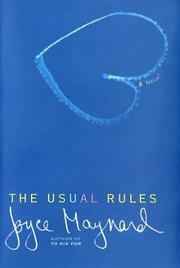 The Usual Rules is the tale of 13-year-old Wendy--Living with her mother Janet, younger (half) brother whom she loves to death, and her mother's second husband Josh, worrying about her appearance--a normal teenaged girl. The date is September 11, 2001. Her mother, a former dancer, is working as a secretary on the 84th floor in one of the buildings that collapses on that fateful day. Later, as the fact that her mother really is gone is settling in, her real father who hasn't seen her for years steps in and sweeps her off to California with him--where she discovers a new part of herself as she deals with the unspeakable tragedy she's suffered. What I most enjoyed about this book were the relationships between Wendy and her stepfather, as well as her father. Most books depict the stepfather as a horrible demon from hell. (Although, thinking about it, where else do demons come from?) But in this scenario, Josh (the stepfather) is the more loving parent, whereas Garrett (Wendy's birth father) is kind of a bad parent at first, having not seen his daughter or had any children to care for around 6 or 7 years. He wasn't a very good father for those first years either--cheating on Wendy's mother was one of the bad things he did that caused her to leave him. I'm including an excerpt from the book here. Just a warning: Ms. Maynard decided to not include quotation marks for the entirety of the book. I personally liked this style--I think it increased the feeling that Wendy had retreated into herself after her mother's death. However, it takes a little getting used to. He [Garrett] opened the fridge. Here, he said. See what hits the spot. It was nothing like their refrigerator back in Brooklyn, with half a dozen different kinds of cheeses and the crisper drawer crammed full of vegetables that her mother used to complain were always more than they needed. You never know what you're going to feel like, Josh used to say. Could be cold roast chicken. Could be a bagel with cream cheese. A person has to be prepared. Here there was a stick of beef jerky and a package of sliced turkey breast. Store-bought tomato sauce. A couple of eggs. Margarine. Never trust a person with margarine in their fridge, Josh told her once. Stop giving our daughter these ideas, her mother said. The first thirty-five years of my life, that's all I ever had. Wendy was still standing in front of the open refrigerator. Nothing strikes your fancy, huh? Can't say I blame you. But I was saving the best for last. He opened the top door, the freezer. A half dozen Healthy Choice dinners were stacked inside. Take your pick, he said. The sky's the limit. In the end, she settled on a couple of Oreos. That's genetics for you, he said. I love these things, too. He had fixed up a room for her. It must have been his workroom before, because there were still boxes stacked in the corner with papers and a few more tools and art supplies. But he'd put an India-print spread on the bed and a vase of flowers next to it. He'd set up a stuffed lion on the pillow. It was mine when I was a kid, he said. Of course you're too old for that kind of stuff. I just thought you might like a little homey touch. He set her bigger suitcase on the floor at the foot of the bed. In a day or two, we can set you up with whatever other stuff you need. You probably like music, right? We'll head over to Circuit City and get you one of those portable CD players. Just don't tell me you like rap okay? She hadn't pictured herself this way. Actually playing music in some room other than the one back home. Hanging her clothes up in this closet next to the box of tools. No, she said. I listen to jazz mostly. But I like Madonna and Ani DiFranco and Sade. He left the room. When he came back, he was holding something--a very old photograph of her mother, from when she had long hair. Pregnant, from the looks of it. Janet kept most of our pictures, he said. I only have a few. She looked at the face in the picture. Her mother wasn't exactly smiling. She had a puzzled sort of expression. Wendy wondered if even then they had been arguing. We had different ideas about a lot of things, he said. She was more the type to want to settle down and make a home. I never believed in traditional family structures. It always seemed to me like most people's problems start with their parents. I wanted things to be a little looser, hands-off. Like the whole world was your home, instead of just one place. You can see the difference between the sweet, comforting feeling of Wendy's home and family in New York and her new life and awkward relationship with her new father in California. Family. The truth is, this book isn't about 9/11. It's about familial relationships. This book includes a mother, stepfather, half-brother, father, and even that father's girlfriend. You can't really define family. Almost everyone has their own definition. Some people's entire families aren't even related to them at all. That doesn't deduct from the love you can show them. And reading this book helped me (and probably numerous others) realize that.